SuoNa( also called laba) is a Chinese folk wind instrument，It was originally introduced into China from Persia . A musician playing an instrument very similar to a suona is shown on a drawing on a Silk Road religious monument in western Xinjiang province dated to the Jin dynasty (265-420). By the time the Ming and Qing Dynasty, Souna was already established in northern China. It has a distinctively loud and high-pitched sound, and is used frequently in Chinese traditional music ensembles, particularly those that perform outdoors. Suona is very popular in China’s vast countryside in funeral, wedding, and other celebrative occasions. Meanwhile, it is also an indispensable part of a number of local operas in Hebei, Shandong, Liaoning, , Shanxi, , and Guangdong provinces. 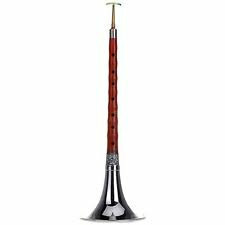 The suona has a conical wooden body, It uses a tubular brass or copper bocal to which a small double reed is affixed, and possesses a detachable metal bell at its end. Traditional suona tube body has eight vents, Respectively, by right index finger, middle finger, ring finger, little finger and left thumb, index finger, middle finger, ring finger to press to control the pitch. The suona is characterised by its especially loud blasts and distinctive Northern flavour. 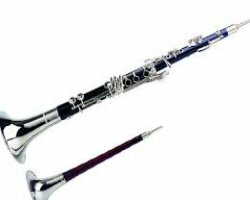 Once a suona is blown, its sound immediately takes lead among all other sounds and audiences are drawn to it instinctively. Since the mid-20th century,“modernized” versions of the suona have been developed in China. The traditional suona has been revolutionised to fit the needs of the Chinese orchestra. Variants of the suona, like the Treble suona(gaoyin suona), Alto suona（ zhongyin suona), Tenor suona( cizhongyin suona), and Bass suona( diyin suon)) have been created to play once unreachable note ranges . Today’s concept of the suona is a large range of trumpets that is used by many of the common folk. The bigger suonas can measure up to five chi (achi is about one third of a metre), while the smaller suonas are only a few inches long. The present Chinese orchestra makes use of the traditional suona and a series of revolutionised suonas to help cover gaps of sound which the traditional suona cannot accomplish.